One of the trips to discover Tuscany could also be to appreciate or buy hand made items or admire craftsmen going about their work and the ancient crafts. In fact, the Tuscan Artistic Craft is known about the fine crafts jewelry, ceramics, the art of embroidery, glass, leather goods and woven. The fact is that, everywhere in Tuscany, you will find shops, studios and art-workshops that enchant us with the inventiveness, the craftsmanship and the quality of the works. Here, you can learn about the artisans and visit their workshops, laboratories and workshops. 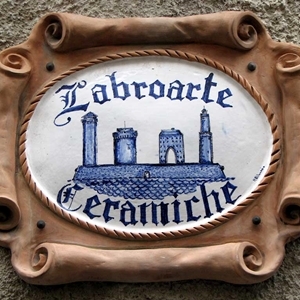 The laboratory of “Giotto” art pottery is located at Le Fonti, near Monte San Savino. It was founded by Giotto Giannori in 1919. 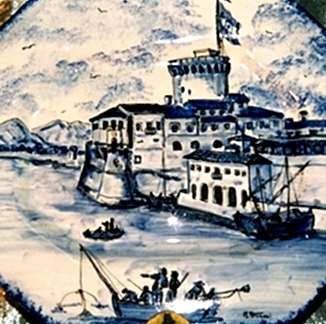 Since 2003 the pottery tradition has continued the family as well as by Herald also Giannoni by children Arianna and Alessio, who return to proven styles that characterized the “Bottega Giotto” and introduce the most current styles, which meet the tastes the most “modern customers.” As always the objects are inevitably “unique pieces”, each with a story in itself, being handmade. Services: bronze sculpture, pottery, resin, artistic painting (portraits), decorative objects on demand, courses and custom molded. Francesco Battaglini is a versatile artist who is predominantly focused on artistic sculpture and portrait painting. In his study Fine Art Francesco Battaglini, realizes the decoration for both exteriors and interiors, in addition to work on large, as portraits, sculptures and fountains. His work is based on the harmony of the delicate and harmonious forms that can be customized and created specifically for the customer, considering the economic and stylistic demands required. The work carried out are almost always unique and handmade. The materials used are varied, from the polyurethane resin to the metal castings, from rough stone up to the glass and iron. Penko’s workshop deals with the creation and production of jewelry. 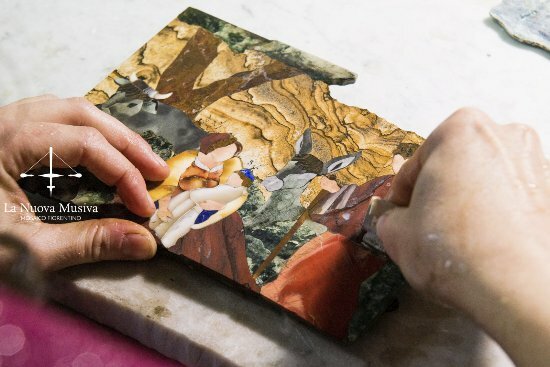 Paolo Penko, art master goldsmith, designer and sculptor has a deep knowledge of Renaissance art and they are connected to many of his works. In his workshop in the heart of the city of Florence, near the Duomo, together with his wife Beatrice, an expert in gemology, it creates unique jewelry, made entirely by hand, using the ancient techniques of the Florentine goldsmith tradition. The leather is the main material artistic expression of Nicholas and Michael, two artisans who make functional and modern artefacts in unique leather and designed to last. Services:pottery classes, works on demand. 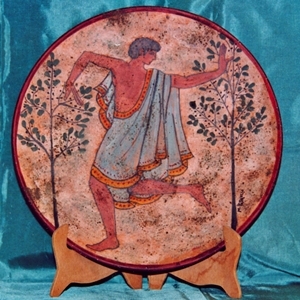 Maurizio Petrucci, master of Art revived the ancient art of showing off ceramics and painting skills with statues, portraits, executed with the processing techniques used in Tuscany since the Etruscans. In his laboratory Labroarte Ceramics run reproductions of old prints, buildings and monuments on plates and trays made into high-quality works. His works are found in public buildings, churches, associations, within the Naval Academy of Livorno. Maurizio in the laboratory are organized courses in ceramics. Since 1949 the Art Foundry Massimo Del Chiaro is a perfect combination of art and technology in the field of artistic fusion. For decades, the great artists of contemporary sculpture choose the foundry Del Chiaro to give shape to their projects, making use of the expertise of thirty skilled craftsmen, followed step by step all the steps leading to the completion of a work in bronze. The foundry is a company of great prestige in the international art scene and “signature” extraordinary works, admired all over the world. In the foundry are performed the construction of clay enlarged models, negative molds rubber and bronze castings made with the authentic lost wax casting method. The Art Foundry Massimo Del Chiaro is always available for every artist and every creative to transform an idea into a Work of Art. List of art workshops in the city of Carrara with its possible to be visited. 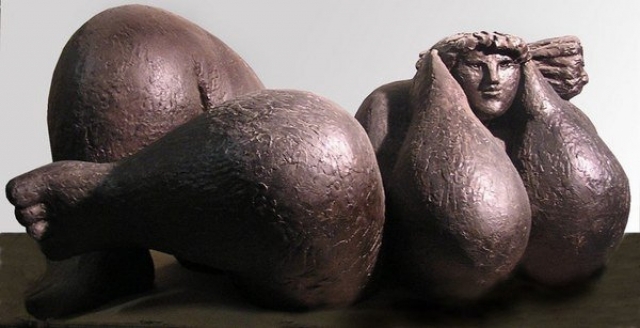 Sculpture courses from mid-May to mid-October. For the remaining period of reservation. Marco Ricciardi invents the first alabaster candy, a production that for 30 years produces culinary delights stone. His creations are available to a public willing to accept appealing provocations. His work has appeared in: Magazine, Grazia, Gadgets, living House, Farm. 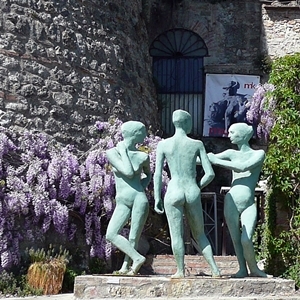 The Eco Museum of Alabaster in Volterra is home to some of his creations. In the workshop Lampadani are shaped wrought iron creations and mulberry paper entirely handmade .. Over the years, the laboratory has given rise to a wide range of models is inspired by geometric elements that forms natural as the flowers and trees. Lampadani produces handcrafted lamps (certified CE) and home accessories such as coat hangers, shelves, mirrors and tables, with a strong artistic impact, original forms and details. Laura Balla is a painter and illustrator and also performs works on commission. His enchanted world is made of mirror pieces, colors, designs and puppets, and fragments of trasfiguarata reality. The universe of signs and figures the artist is to surrealist fairy tale and narration, animated by dreams, fears and desires, individual and collective.